Timber floors are highly durable and contribute to a healthier indoor environment, but they get worn out or damaged over time and need restoration. There are factors that can worsen the condition of wooden floors and lead to their restoration. As you know, timber flooring is a living material (natural product). It can be affected by strong sunlight, wear, humidity and temperature. Wood could be damaged by high levels of moisture if they are not properly controlled. The recommended temperature in the areas where timbers are laid on is between 18-24 degrees. If it’s higher than this, the wood may become dry and overheated. Our experience has proven that many customers have their floor damaged by pets, strong cleaning detergents, while moving furniture or dropping sharp or heavy objects on the floor. Sometimes, even regular care of the timber floor is not enough to preserve their surface as particles of dirt and grit get trapped on it. After completing the sanding, we will stain and seal the floor depending on your personal preferences. If your want to bring your timber floor to its top condition and it just needs light renovation, then what has been done first is sanding. This technique repairs any bumps and make the floor flat. Its purpose is to take off the old finish and prepare the floor for applying a new color and sealing it. 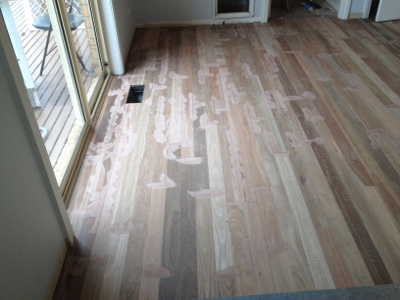 Regardless of the damage to your timber floor, we can repair it for you. We have solid experience and proven track of happy clients with problems including scratches, dents, nicks, discolouration, sunlight, water damage, uneven surfaces, and worn out varnish. Polishing (Sealing, Varnishing): Our timber floor polishing service will help you refresh the finish of your wooden floor and extend its life by several years. Your floor will become bright and lively again and will look just like new. However, the polishing service won’t be a solution for floors which are already seriously damaged and have hard stains and scratches. Gap filling: Many homeowners have problems with holes, nicks and cracks in their wood floor. Usually they show up because of the long term timber floor expanding and contracting. Gaps in timber floorings not only look unattractive but also trap dust and dirt between boards. We can help you to get rid of the gaps using our special methods of gap filling and resolving the problem for a long time. Refinishing: Before applying this technique, the old finish from your floor has to be sanded off. After sanding, all nicks and gouges in the floor are filled and the area is cleaned from any dust. Then, the floor is going to be coated with the finish and ready to return its previous gorgeous look. Hand scraped flooring: If you want to transform the appearance of your floor into old looking and worn, then a good option for you is the hand scraped timber floor. Nowadays it is tendency to have such kind of floors. They are made with special tools that create patches and indentations on them to imitate aged look. These floors have good protection against moisture because of the highly effective finish they are covered with. Smoothing: If your floor is rough and there are some deep scratches or dents, you may not need to refinish it completely. Instead, you can take advantage of our fast and cost-effective smoothing service that will restore the fresh appearance of your timber flooring. Floorboard (Plank) replacement: If you have creaking floorboard, missing or uneven planks or if a whole section of your wooden floor needs to be replaced, we can help you with this as well. It is difficult to do it on your own because this job requires professional tools and expertise. If you would like to give your timber floor a new look and think of changing its color, then floor staining is exactly what you need. Staining the floor is one of the most pleasant works after all the hard job of timber installation, reparation or sanding is done. Staining is not as difficult as other floor techniques, but still it requires expert skills and knowledge in order for the final result to be satisfying. We have seen many wood floors that have been badly stained and have unattractive appearance. So, don’t let this happens to you and try our floor staining service! We use only the best products that guarantee excellent results. We work with different kind of finishes to make the floor look bright or dark, more contemporary or aged. As part of our services we are able to offer you a free consultation about the choice of color that will be suitable for your floor and home design. We can apply several different options to a small section of the floor for you to choose from and then we just sand these samples off once you have selected a color.